In just a maximum time of 40 minutes, you can already taste the traditional noodle soup of the beautiful country of Thailand. Of course, this tasty chicken soup can never be complete without the presence of the chicken meat. Some other important ingredients you need to prepare are fried garlic, coconut, rice vermicelli, broccoli, and peanuts. Tibet is the origin of this delicious soup. 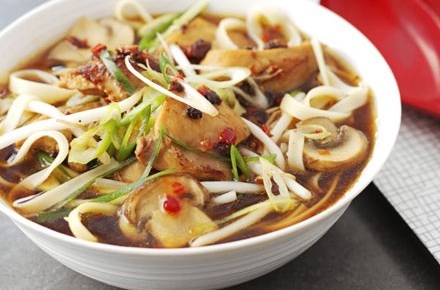 It is the traditional noodle soup of the place, which is made from carrot, onion, flat noodles, green chillies, lemon, salt, olive oil, soya sauce, honey, garlic, coriander leaves, spring onion, ginger, and of course, the chicken meat. This is actually a Singaporean cuisine that is very popular all over the world. One thing that made it extremely famous is its rich and delicious authentic flavor. Noodles, prawns, and chicken meat are the important ingredients needed. For the delicious soup, water, some exotic spices, laksa paste, and shrimp paste are needed. This simple yet very delicious chicken soup dish is something that is hard for you to ignore. You can have it on your dining table in no time; 25 minutes is enough. 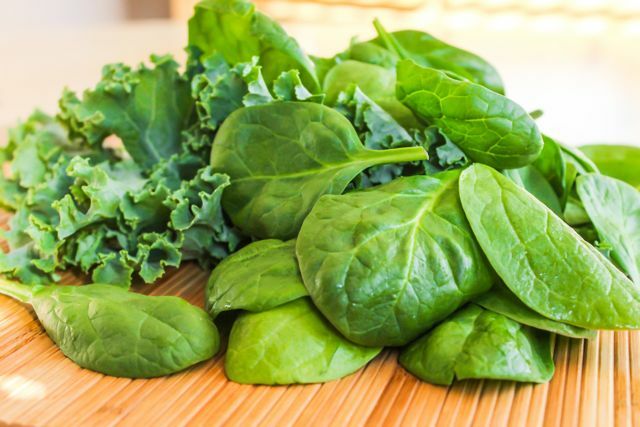 This nutritious and heartwarming soup only needs spinach, fish, and chicken meat for it to be cooked. If you love savoring noodles when you are hungry, then this noodle soup dish will definitely satisfy your palate. What you need to do is boil an amount of water that is added with garlic, lime juice, and coconut milk. When it boils, put some sautéed chicken strips and of course, the noodles. This delicious chicken noodle soup is very easy to prepare. It only needs 40 minutes of your precious time. This is actually the pride of Asian countries when it comes to soups, particularly the beautiful country of Laos. Adding to the great flavor and aroma of the soup is the fried garlic that will serve as its garnishing. The delicious oriental flavors of the classic Tom Yum Soup will definitely reside on your palate. 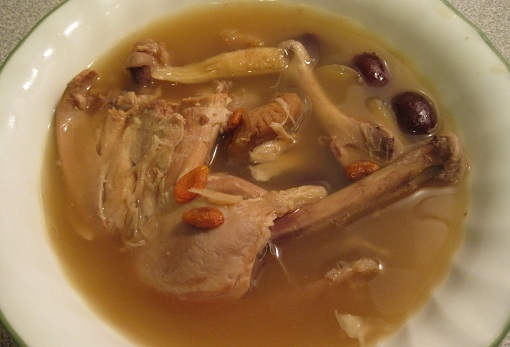 It is a chicken soup dish that you won’t forget once you tasted it. Aside from the chicken meat, where the chicken stock is taken, mushrooms, baby corns, broccoli, and fresh prawns are the important ingredients in this dish. 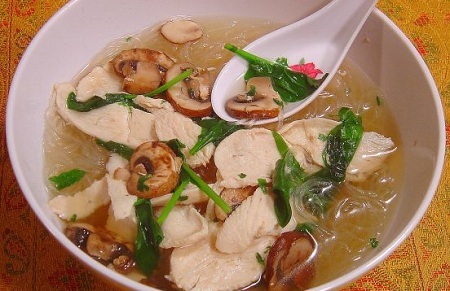 The essential ingredients of this delicious chicken soup dish are cloves, green chillies, lemon juice, mint leaves, soya sauce, coriander leaves, choy leaves, salt, malt vinegar, cinnamon, sugar, black pepper, fennel, radish, garlic, ginger, carrot, celery, onion, and of course, the chicken meat. This dish requires 2 hours before it can be served. The word “Mulligatawny” actually means “pepper water”. This is actually one of the delicious Anglo-Indian dishes that is very popular in the whole world. The needed time in cooking it is one hour. The ingredients needed are some fresh spices, turmeric, lentils or rice, and the chicken meat. This is an authentic Chinese soup that will surely make you happy once you tasted it. This is a very healthy chicken soup dish since the ingredients are some fresh vegetables that are chopped in smaller sizes apart from the chicken meat. These are the 10 delectable chicken soup food recipes that you will surely love once you tasted them. Serving these dishes on your dining table is certainly a good decision.